A lot of times life isn't as much about where you are but who you're with. My time in San Diego was a perfect example of that. Sure, I was living in a beautiful city with nearly perfect weather, but it was my friends who really made it home for me. About a year after graduating from WSU, the CBS affiliate in San Diego took a chance on a wide-eyed, extremely green sports reporter from Great Falls, Montana. I was pretty rough around the edges when I first started, but they must have seen potential and decided to stick it out with me. During my 4.5 years there, I learned a lot about TV, sports, and reporting...and in the meantime made some of the best friends in the world. So when one of my friends (Melissa) was having a baby shower in SD, one of my other friends (Laura) was throwing a birthday party for her 2-year-old son Jack, and a third friend (Megan) was celebrating her own birthday, I knew I just had to be there. Laura enlisted my help in re-creating some Elmo cupcakes our friend Erin spotted on Pinterest and I wanted to share them with you. Laura took care of the baking portion ahead of time. She made some delicious Ad Hoc red velvet cupcakes, so naturally we just had to make a cream cheese frosting to go with them. To do this, we combined room temperature cream cheese, room temperature butter, powdered sugar, and vanilla extract. And then we dumped in an entire bottle of red food coloring paste. For this reason, it's extremely important to use a very concentrated color and buy a high-quality, tasteless food dye. These were Erin's idea and she was a great sous-chef. 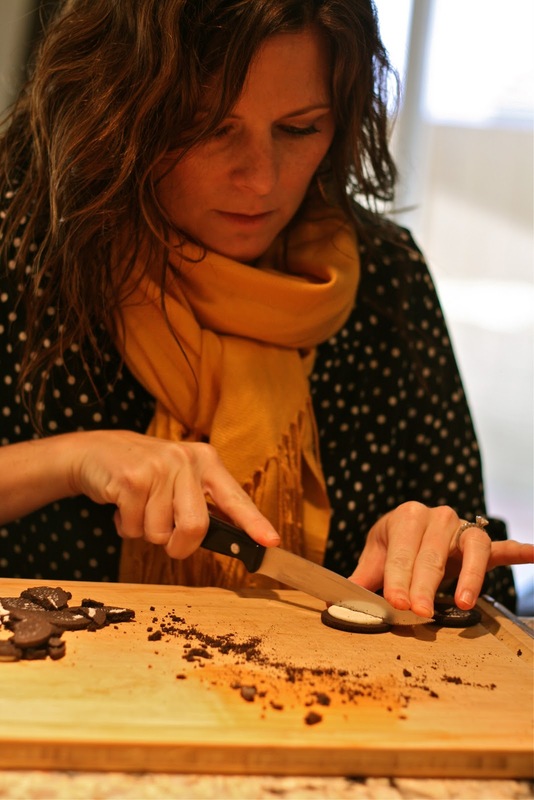 She was in charge of separating the Oreos and cutting them in half. We also decided to cut the marshmallows in half because full marshmallows just looked too scary. I was in charge of the piping. And yes, that's my champagne in the background. Because when you are frosting 48 cupcakes, champagne is definitely necessary. I used a #21 Wilton star tip to simulate Elmo's "fur." Add the eyes, nose, and mouth...and...ta da! 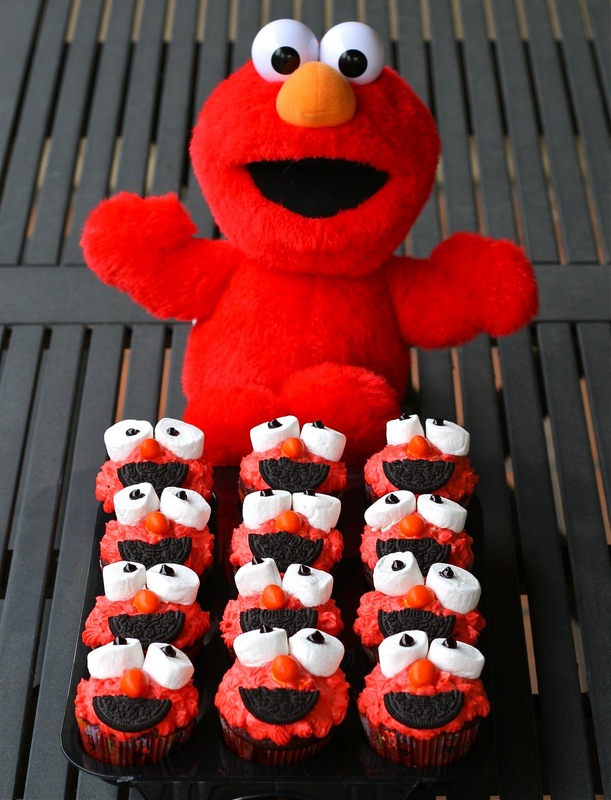 You too can make Elmo cupcakes! We used halved marshmallows for the eyes with black gel for the pupils. You can use orange candy of your choice for the nose, and half of a separated Oreo for the mouth. The best part about them? The birthday boy absolutely ADORED them. Jack is obsessed with Elmo, so it was a no-brainer for Laura to do a Sesame Street themed party. 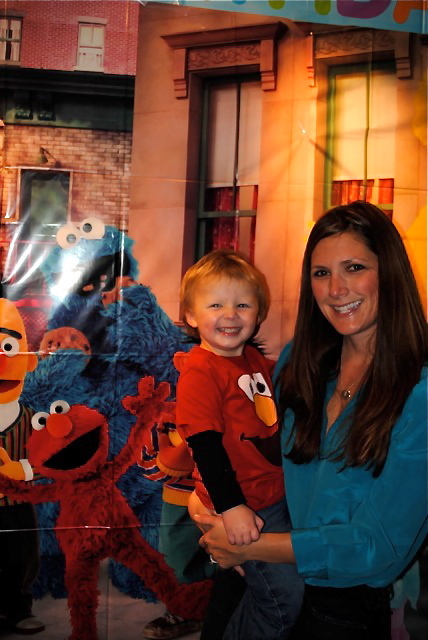 Jack calls Elmo "Ido" (we think because Erin is Auntie "Idie"), so there was lots of smiles and "Ido's" being shouted throughout the house on Sunday. Check out Jack's place setting at the dinner table! Ido Central! Look at that smile! Jack is very good at saying "Cheeeeeese." Laura even had a Sesame Street backdrop perfect for photo taking with Auntie Jaymee and Auntie Idie (Erin). And of course, I would be remiss if I didn't mention the amazing spread Laura put on for her close friends and family. I helped with the veggies (brussels sprouts and green beans), and she cooked THREE (yes, three) beautiful turkeys (thanks Darin for the gorgeous carving). We also had mashed potatoes, gravy, stuffing, cranberries, salad, rolls...it was quite the feast. 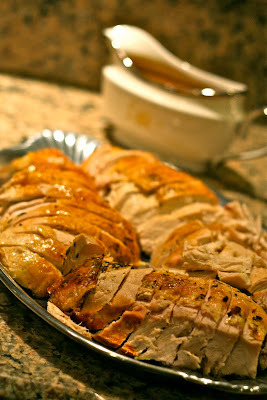 Thanksgiving in January! I'm so thankful for my fabulous friends. Happy Birthday Jack!! 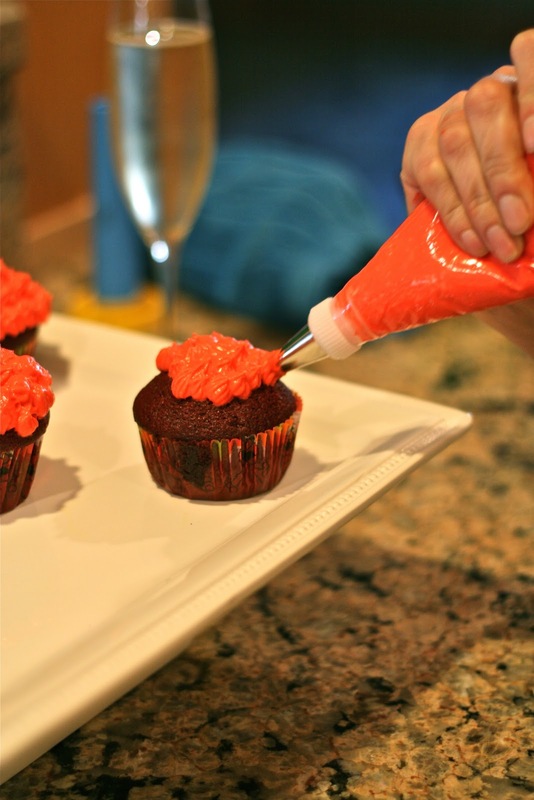 Using a stand mixer, combine all frosting ingredients except the food coloring and beat until well combined. Add red food coloring until frosting is a bright Elmo red. Using a #21 Wilton Star tip and pastry bag, pipe the "fur" onto the cupcakes. Separate Oreos and cut each one in half. Halve marshmallows as well. Arrange on cupcakes to form "face"...along with orange candies and finishing with black pupils. Keep refrigerated if not serving right away. 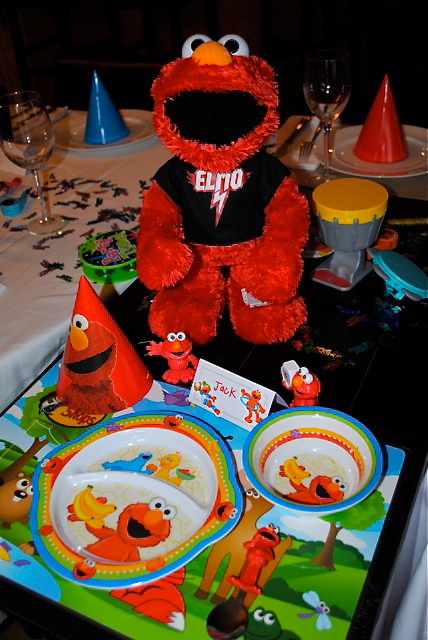 my son LOVES elmo and was thinking of doing something like this for his 2nd b-day. 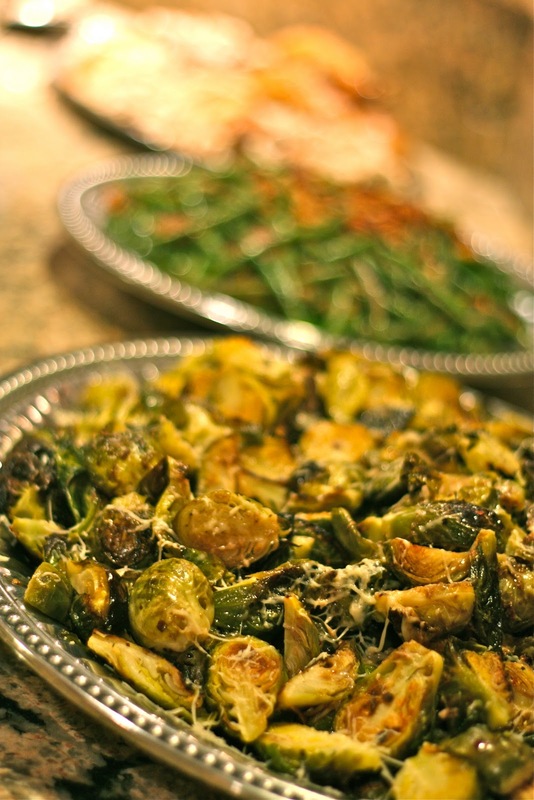 also those brussels sprouts are making me drool! love them! Miranda...your son will love these! Oh those are so cute!! Looks fairly easy too! 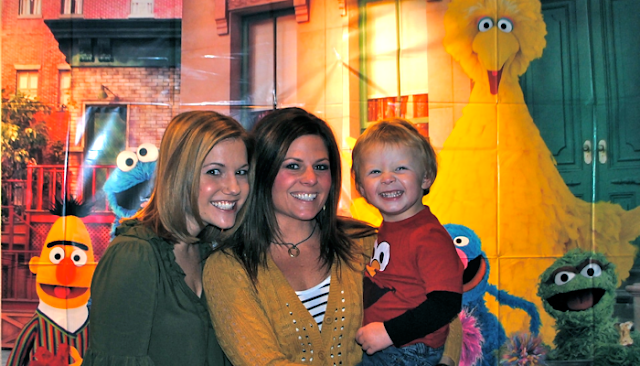 :) What a fun idea for a bday party!